Paula Bennett talks to Tova O'Brien. Credits: Video: Newshub, Photo: Office of the Governor General. Zhang Yikun is the Chinese businessman caught in the middle of the National Party's latest political scandal. On Tuesday, ex-National party MP Jami-Lee Ross alleged his former boss Simon Bridges had illegally covered-up a $100,000 electoral donation made by Mr Zhang. "The full $100,000 donation has not been disclosed to the Electoral Commission," Mr Ross said to media. Mr Ross named Mr Zhang as the donor, saying he and National Party leader Simon Bridges had dinner with the businessman before the money was donated. National's deputy leader Paula Bennett confirmed Mr Bridges had spoken with Mr Zhang at a dinner about how he could support the party. "Look he said he certainly had conversations with him and with others that have wanted to support the National Party," Ms Bennett told RNZ. "He certainly thinks that it may have come up that he had said 'I want to support the National Party', Simon knowing that Jami-Lee knows him, probably did put him onto it, so we're trying to dig through all of it, remember (what happened) some months ago." According to a tweet by University of Canterbury professor Anne-Marie Brady, Mr Zhang is "a leader" in Chinese Communist Party (CPP) United Front work activities. The United Front is a Chinese Government group aiming to promote the policies and ideals of the CPP. 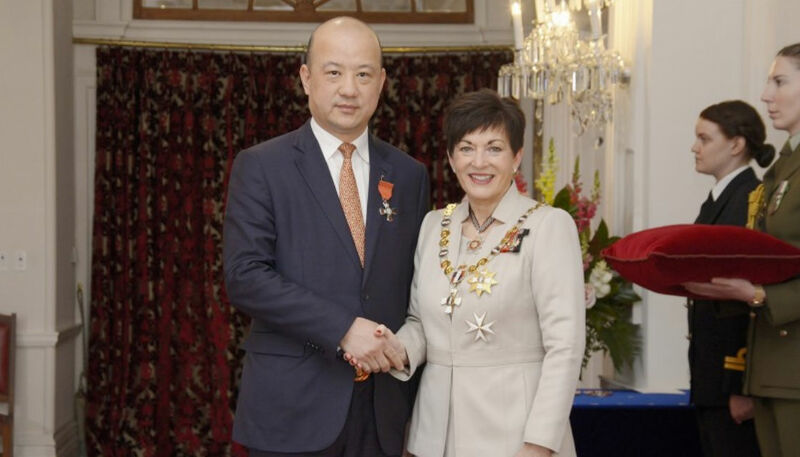 NZME also reported that Mr Zhang was put forward by the National Party for a Queen's Birthday Honour and was made a member of the New Zealand Order of Merit in September. Mr Zhang also has a professional relationship with Southland Mayor Gary Tong, who had welcomed Mr Zhang as an informal business advisor earlier this year, according to the Otago Daily Times (ODT). Mr Tong and Mr Zhang are currently in China together. Mr Tong said no money had been exchanged between the two, and Mr Zhang had not yet been called upon for financial advice. "There's a letter saying that we would look at him [Zhang Yikun] for any business advice for the future" Mr Tong told the ODT, "but that hasn't occurred as yet". It was revealed through an OIA that Mr Tong received a sponsored business trip to China last year, in return for two legs of lamb and four crayfish. Jami-Lee Ross said yesterday said that he did not believe Mr Zhang had done anything wrong, and had "unfortunately been sucked into this activity, which is unlawful, at the hands of Simon Bridges". A prolific member of the New Zealand Chinese community, Mr Zhang is an organiser of Chinese trade expos and youth scholarships. He owns $40 million in Auckland property, according to NZME.